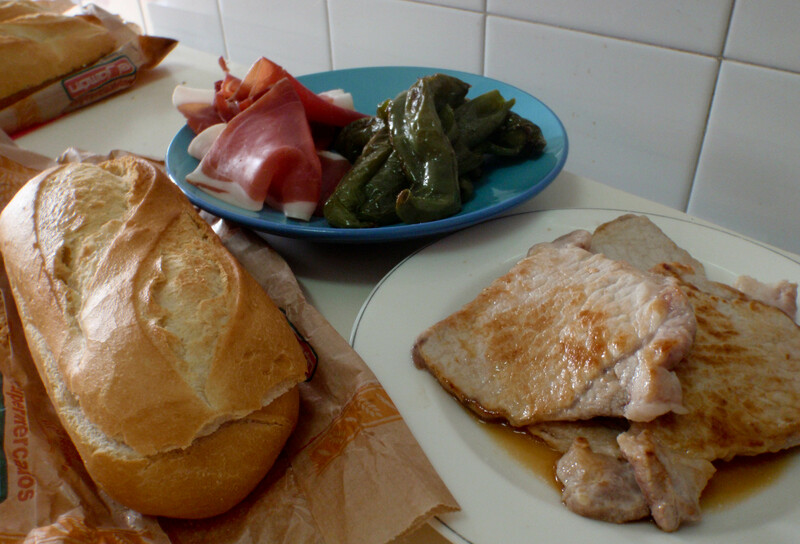 The serranito is a really common sandwich here in Sevilla. You can find it on the menus of most restaurants offering normal Andalusian fare, and therefore you are a lucky lucky duck. Mini sandwiches are a super popular food option, which shouldn’t be a shock considering we are talking of the land of tapas. There is a chain of restaurants here called Cien Montaditos, which is devoted to one hundred different little finger sandwiches. They usually come with pork or chicken, sometimes an aged sheep’s cheese, or salmorejo -both soup and sauce – among other things. 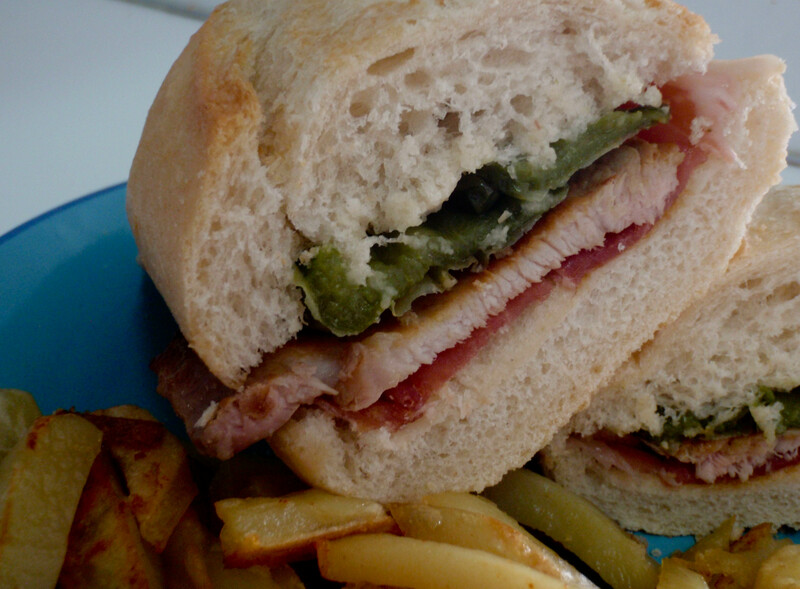 The serranito is usually larger, for the hungrier person, or someone more decisive who rejects the smorgasboard of sandwichettes. When I can’t decide what to eat, but know that I need something to absorb the beer that I have been using to cool me off in these surprisingly hot spring days, I opt for my dear friend, el serranito. Would it surprise you that jamón is involved? Good, fresh, crunchy bread. Baguette style of thing. Slices of jamón serrano – USA peeps, use prosciutto or a high quality cured ham. This is not brain surgery, but it is a great sandwich. Actually, in the process of writing this, I’ve realized that serranitos have become a comfort food for me. It’s filling, not too heavy, and makes me happy when I eat it. If only everything in life could be this simple. Ok. Let’s build. The peppers come first. 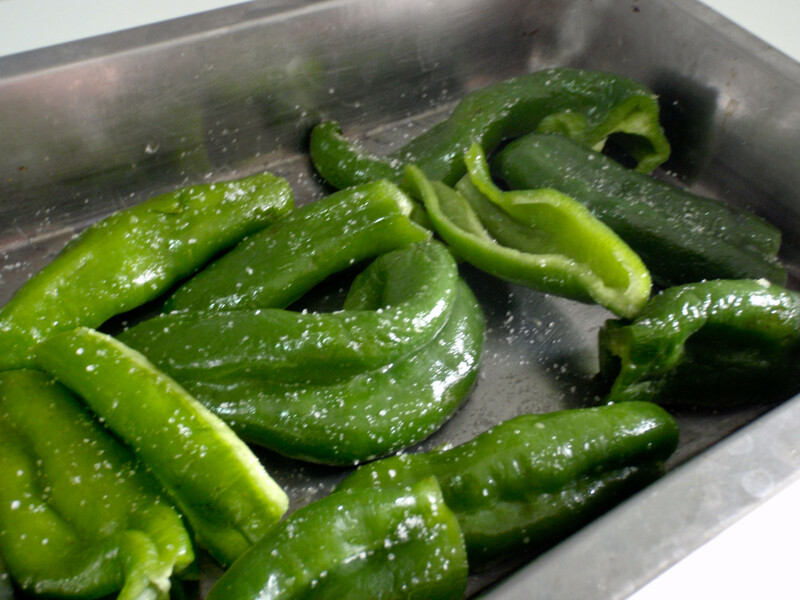 Cut off the tops, seed them, and slice them in half so they lie flattish in a roasting pan. Toss them with olive oil and salt. Broil them until soft and just beginning to blacken. Turn them a few times during the process for even cooking. While the peppers are cooking (15 minutes or so), put a dash of olive oil in a large fry pan and cook the pork fillets, lightly salted. Set them aside. Now, if you’d like, you can make a sauce for the sandwich by adding a little bit of olive oil and lemon juice to the juice left behind by the pork fillets. Tasty, tasty. But I didn’t get nearly enough sauce. I chose alioli, which is Spanish for aioli. 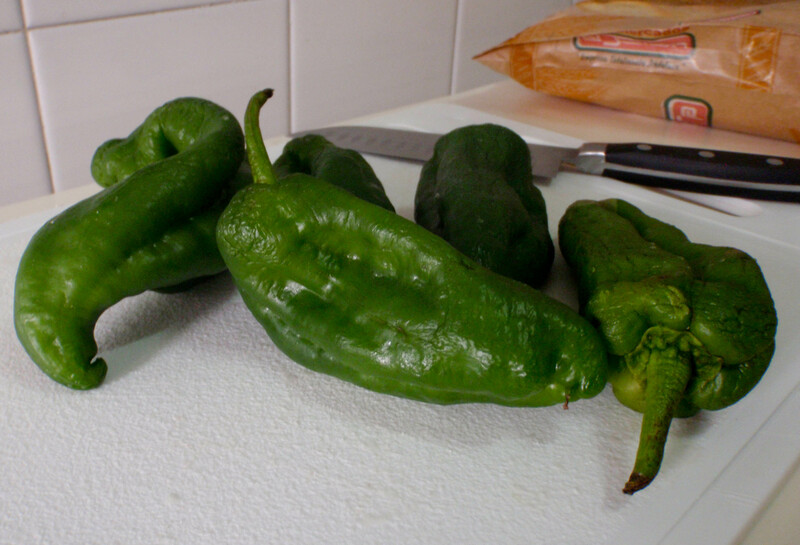 My alioli recipe comes from this website, which is a great source for Spanish recipes. As it is in Spanish, though, the recipe follows in English. 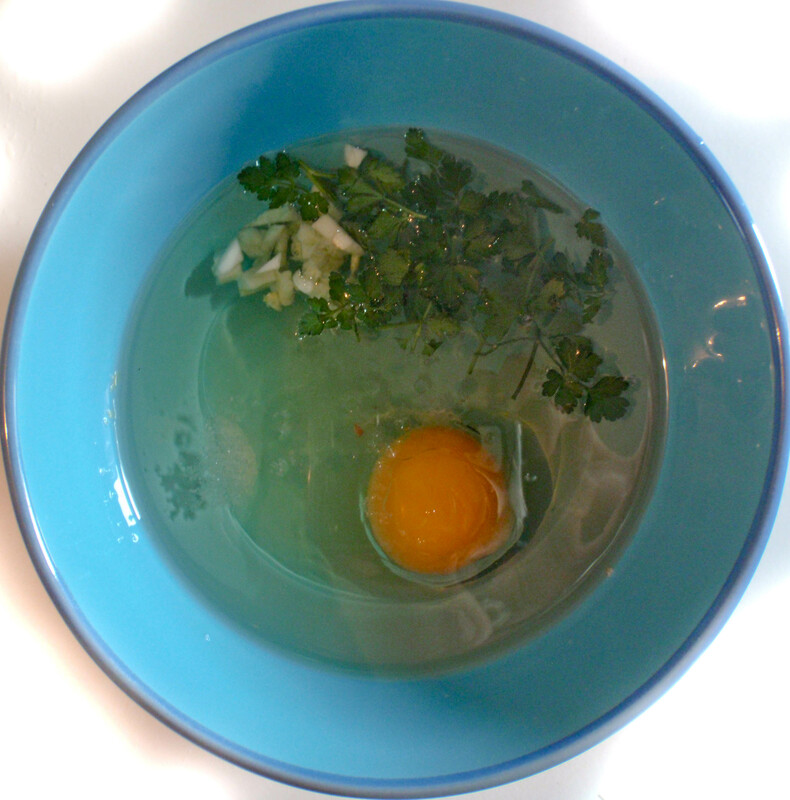 Parsley – I use a tablespoon of chopped parsley with a little more to toss in later. Parsley from my tiny terrace garden! Lump all the ingredients together and blend. Here everyone has immersion blenders (I think because of the prevalence of gazpacho and other purees), but using a stand blender is not going to magically make everything fail. 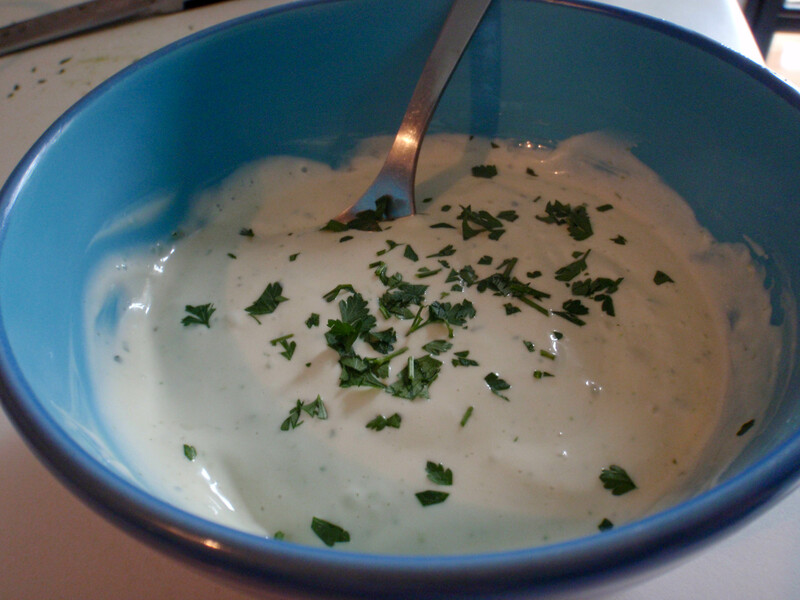 If you are using an immersion blender, don’t move the blender until it thickens and takes on the familiar, mayonnaise look. Then go ahead and mix well and completely. If using a stand blender, blend all the ingredients WITHOUT the oil first. Then add the oil little by little until it takes on the consistency that you’d prefer. I add in a little parsely at the end so it has pretty green flecks. Then, refrigerate. It tastes better after a few hours. A quick note. On hearing this recipe, my friend Sergio declared himself King of Aliolis and protested the use of a blender. He insists that you must use a mortar and pestle. Which I do not have. So whatever. If he deigns to share this recipe, I will pass it on. Assemble your ingredients. 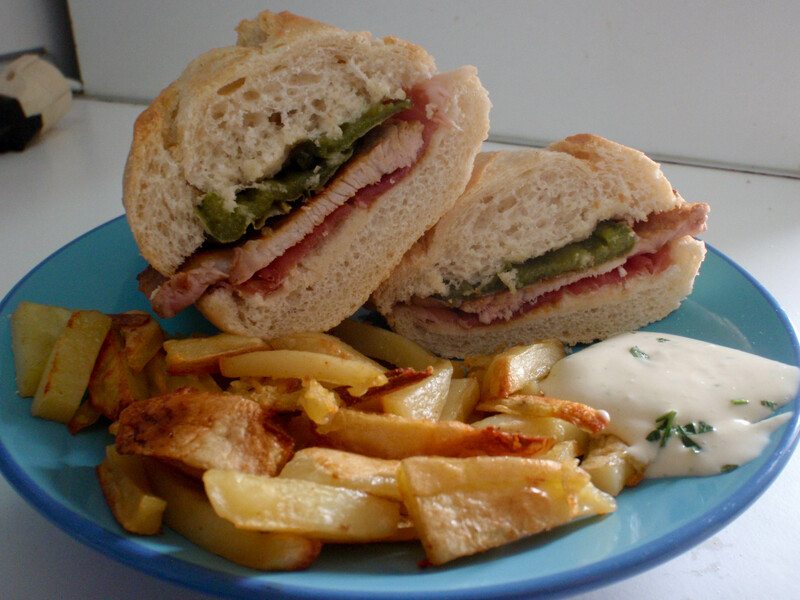 Sliced bread, cooked fillets, peppers, and slices of ham, whatever type you can get your hands on. Spread a thin layer of alioli on the bread, lay down a thin slice of ham, the fillets, the peppers, then top with the other alioli-ed half of your roll. Serranitos are very often paired up with french fries, so I instead of broiling the peppers, I stuck them in the oven on high with a cookie sheet of oiled potatoes for oven fries. Eat, smile, and feel Andaluz.